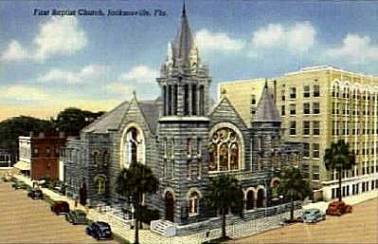 Architect Henry John Klutho (1873-1964) rebuilt Jacksonville, Florida, after the Great Fire. Fire destroyed the city on Friday, May 3, 1901. In only eight hours 1,700 buildings burned to the ground. In New York Klutho read newspaper accounts of Jacksonville’s destruction and its spirit to rebuild. He closed his office and headed south. “I decided to go after about $10 million of the destroyed property,” he said. Klutho remained in Jacksonville for the rest of his life. “He was one of the few architects in America who could stroll downtown in a city and see one or more of his unusual buildings in nearly every block. 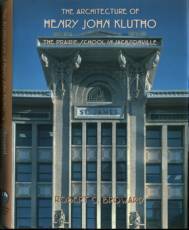 It is no wonder that he considered Jacksonville his own personal creation said Jacksonville architect Robert C. Broward, author of The Architecture of Henry John Kutho: The Prairie School In Jacksonville (University of North Florida Press). “His buildings are the best examples of Prairie School (style of architecture) left in the country,” Broward said. “In my opinion, his work will be important a hundred years from now, when few other buildings, even those being put up downtown right now, will still be standing”. 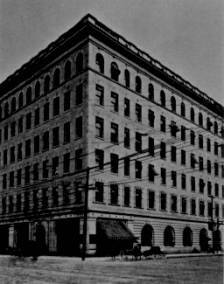 Klutho’s first commissions in 1901 included the Dyal-Upchurch Building at the corner of Bay and Main streets, the T.V. Porter home, and the St. Clair-Abrams Mausoleum in the St. Mary’s Section of Evergreen Cemetery. 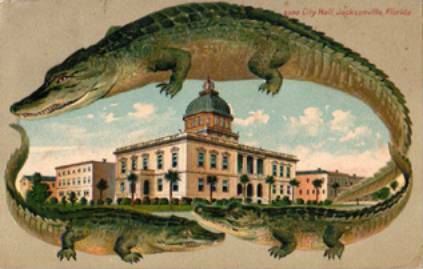 By October of 1901 Jacksonville had issued more than a thousand building permits. That month Klutho won a competition to design the new City Hall. The City Hall building was constructed for a contract price of $61,966.47 – about $2.95 a square foot. It was demolished in 1960 to provide a site for the Hayden Burns Library. In 1902 Klutho designed the sanctuary of First Baptist Church. His building now serves as one of the congregation’s educational buildings. 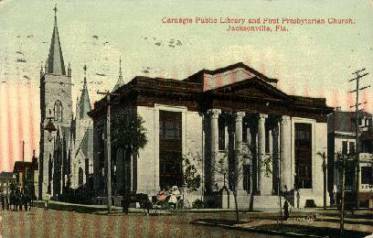 In 1903 he designed the Carnegie Library Building at Ocean and Adams streets. “Design is of paramount importance,” Klutho said. “A project should be so designed as to indicate its function. A church, a school, a hospital, a public building or an office building should each be recognizable as such. A project should be made to harmonize with its environment”. Klutho physically expressed this philosophy in his style of architecture known as the Prairie School. “During the short time that if flourished, the Prairie School produced beautiful, earth-hugging, broad-roofed houses with flowing interior spaces and well-articulated and delicately ornamented cubistic banks, schools, churches and government and commercial buildings,” Broward said. Although Klutho’s work was influenced by that of Frank Lloyd Wright and Louis H. Sullivan, it was his own. “I do not feel that I, in any way, became a copyist – but I do know that their influence is evident in some of my handiwork. However, I am sure that I display enough originality to have my work dubbed ‘Klutho-esque’,” he said. Klutho designed his own home (relocated at 30 W. Ninth Street) after the Prairie School. 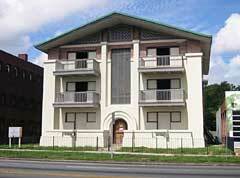 “His home is most significant because of the date it was done (1908),” Broward said. “It was the first modern house in the South. Up to that time, everything was traditional but he looked into a new era”. Broward said that Klutho’s most significant commercial buildings are the St. James Building (which once housed the May Cohens Department Store and has now been restored to house Jacksonville’s City Hall), the Bisbee Buildding, and the Florida Life Insurance Office Building. Klutho was not the only the architect but also the builder of the St. James Building, letting all subcontracts and overseeing the project. He received $40,000 for this work. In January, 1911, construction estimates ran up to $500,000. “The final cost of the St. James Building is unknown,” Broward said. “But if were built today, assuming that such artisans and craftsmen were available, its cost would be in the neighborhood of $24 million”. Following World War I, the Great Depression came and Klutho’s commissions dwindled. “His work brought Klutho fame and fortune, but its vogue was as capricious as the public that had applauded it,” Broward said. 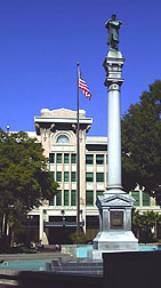 Although he continued work in Jacksonville over the years, designing the West Bay Street Post Office Annex, Lola M. Culver Elementary School, Clara White Mission, Paxon Junior High School and the Hogan Street Beautification Project as well as many homes still in use, Klutho’s popularity had passed. “The feeling of satisfaction at being able to live and work for so long a time and see around you the results of your handiwork in enduring form is sufficient compensation for any heartaches that may have been suffered along the way,” Klutho said. He did suffer heartaches in rebuilding Jacksonville from the ashes. His proposals for beautifying the waterfront were disregarded. His pleas for city planning went unheeded. His innovative style was no longer appreciated. In 1940, when he was reduced to working for younger men designing portions of the Blodgett Homes Public Housing Project, the crediting plaque even misspelled his name – the plaque reads Kluto! “If Klutho arrived in Jacksonville today and searched for its innate character, he would find a city of contrasts,” Broward wrote. “Downtown he would see block after block of automobiles parked where handsome buildings once stood. Many of his own creations that were part of his urban dream, the fruits of his Prairie School period, have been demolished and he would find in their places a glass and concrete skyline crowded to the very edge of the beautiful river that cries out for open space along its banks. He would see all of this complex city teeming with activity from sunrise to until late afternoon but, like so many American cities today, turning into an urban necropolis at night”. Broward said that it would be economically profitable, historical vital, and aesthetically important for Jacksonville’s business community to preserve Klutho’s remaining work. “While a lawyer strives to preserve the rights of the people, the doctor to heal diseases, the clergyman to outline moral and religious paths, the architect designs buildings which render secure the achievements of the past, and provide for the triumphs of the future,” Klutho said. When he died in 1964, Klutho’s obituary stated: “He is survived by much of Jacksonville’s older skyline”.